Santana dos Santos et al. Assessment of functional impact of germline BRCA1/2 variants located in noncoding regions in families with breast-ovarian cancer predisposition. demonstrate novel non-coding variants can have significant functional effects and should not be overlooked. Bespoke analysis allows any laboratory to utilize our unified, information theory-based framework to explore the non-coding effects of their variants. CytoGnomix offers personalized written and oral consulting about your data at no additional cost. Projects are priced according to the number of variants / exomes / genomes to be examined. See our pricing table below for more information. Our tools for non-coding variant interpretation utilize an information theory-based approach to model binding sites and accurately estimate the affinity of these sites to bind with proteins and other macromolecular complexes. 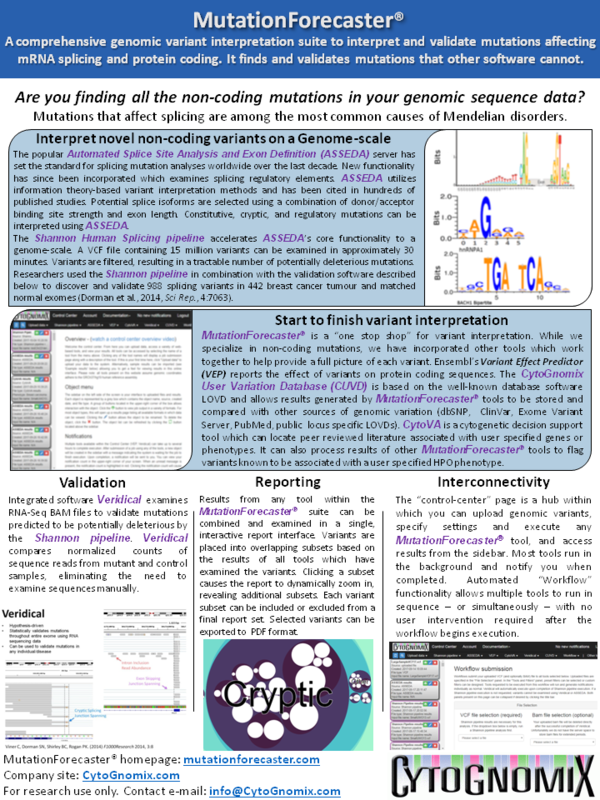 Since ASSEDA became available in 2005, it has been used to interpret splicing effects of 1727 functionally validated variants in nearly 400 publications with ~87% accuracy. High-throughput DNA sequencing data volume provided the impetus for the extension of core ASSEDA functionality to a genome-scale. The focus of the Shannon pipeline, also an information theory-based method, is to evaluate large numbers of DNA sequence changes quickly and filter them into a manageable number of variants suitable for further analysis in the laboratory. Researchers used the Shannon pipeline in combination with Veridical to discover and validate 988 splicing variants in 442 breast cancer tumour and matched normal exomes. Where can I learn more about the capabilities of the tools used in Bespoke analyses? The learn more page on MutationForecaster® provides an overview of each tool as well as several related peer-reviewed publications. Video tutorials are also available for most tools on MutationForecaster®. Although these videos are primarily intended to be instructional, they can also be used to familiarize yourself with what kinds of output the tools generate. Which tools are appropriate for my specific use case? We suggest you first visit the MutationForecaster® homepage and visit the learn more page found in the page header. When you contact us for a quote, we will work with you to choose an appropriate set of analyses. What fields must be present in my submitted VCF file? Our tools require the CHROM, POS, ID, REF, and ALT fields for each variant. If additional fields (QUAL, FILTER, INFO) are present, they need not be removed, however our tools will not take their content into account. Please note although the ID field is required, no specific ID value is required. Where can I read more about the information theory-based method utilized by MutationForecaster® tools? Caminsky et al. 2014 is a comprehensive review article on this topic. It describes information theory and how it has been utilized in molecular biology to express the predicted binding affinity of proteins and other macromolecules to nucleic acid sequences. It also describes some of the tools present on MutationForecaster® including ASSEDA, the Shannon Human Splicing pipeline, and Veridical. Contact us by e-mail or through our web-based contact form for a quote and we will work with you to choose an analysis type appropriate for your research. Additional analyses not listed in the table below are evaluated and priced on a case by case basis. Please note: Our work does not allow us to assess the integrity of the sequence alignment or depth of coverage. Hence, some predicted mutations may not be adequately supported by the raw data. Copyright © 2019 Cytognomix Inc. All rights reserved.